Jurassic Park 4 is now officially on hold, and its previous release window has been obliterated in favor of nothing at all. If you were to ask me a few days ago when you might expect to see Jurassic Park 4 in theaters, I would've have immediately rattled off something about "Summer 2014." Sadly, that was then, and this now. Now, I'd have to say, "I have no real idea, and it may not ever appear." Bummer, no? In coordination with filmmakers, Universal has decided to release Jurassic Park 4 at a later date giving the studio and filmmakers adequate time to bring audiences the best possible version of the fourth installment in Universal's beloved franchise. We could not be more excited about the vision that Colin Trevorrow has created for this film, and we look forward to watching as he and the producers create another great chapter in this franchise's storied history. Notice that Universal gives no reason for the delay, nor any word on when we might expect the film. Instead the studio simply destroys the film's pre-existing "Summer 2014" release date and walks away. Does this spell trouble for the long in-production Jurassic Park 4? Could be, but it could also be an effort on Universal's part to ensure that this film is as great as the first Jurassic Park movie. It's been nearly two decades since that film hit theaters and the franchise's quality has dipped substantially in that time. If Universal's delay is motivated purely by making Jurassic Park 4 the best movie it can be, then we're in favor of the idea. Of course, if it's the studio having doubts over how the production is shaping up, we grudgingly accept that too. What choice do we have? 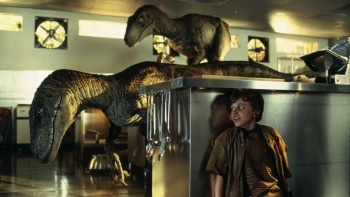 "People versus CGI dinosaurs" is such a purely fun premise that it just wouldn't do to have a Jurassic Park flick that was anything less than epic. Presumably Universal knows this and lives in as much fear of failing as fans do of seeing the velociraptors kitted out with assault rifles and nanotechnology.